Okay, I’ll tell it as it is. I absolutely love Peanuts cartoons. I might be a lot older than the days I’d sit in front of the TV with a bowl of Lucky Charms in the morning watching Lucy pull the football away from poor Chuck time and time again, but I’m not ashamed to say I still watch some of those old cartoons from time to time, and they’re just as endearing as they were to me when I was little. Anyway, enough about that! I was browsing through YouTube when I came across this wonderful video showing a tense dogfight between the World War I Flying Ace and his arch nemesis the Red Baron, but this time they’re battling in real life! World War I Flying Ace Fun Facts: We hope you enjoyed the video just as much as us! For the curious we thought we’d give you some fun facts about Snoopy’s sopwith camel piloting alter-ego. 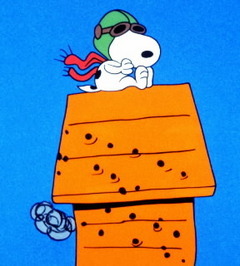 Snoopy first appeared as the World War I Flying Ace on October 10, 1965! Schulz was a veteran of war himself, and fought in WWII! If you enjoyed this article, don’t forget to share it with your friends using the buttons below!